"The overall lesson I've learned in farming is no matter what, even in the middle of when you're failing at farming... it always works out somehow. Each season is amazing in its own way." True mountain man Scott Horner owns a farm nestled away in the western slope of the Rockies. His Community Supported Agrigulture (CSA) farm, aptly named Small Potatoes Farm, not only provides locals with wonderful food, but also a great friend. 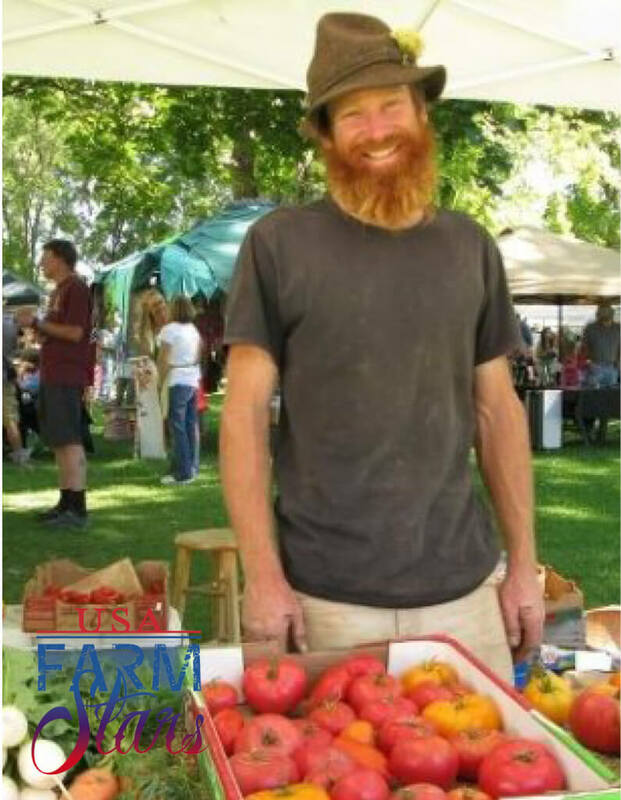 Because of his hard work and his hand in the movement for locally sourced organic food, we have made him a Farm Star. Thing to do after work: Drink beer and watch the sunset! I am in an open relationship with the world. Do you have children? Do they work on the farm with you? Three girls. Sometimes they work on the farm. Where is the farthest you have traveled to? Where would you like to go? What is your attitude about money? I am open to making plenty of it. I have a healthy relationship with money, atool I need to sustain in other ways. When I was going to college it wasn’t what I really wanted to do - architecture and art. I got job at a horse farm and I really enjoyed working with nature, animals and the land. I traveled out west and by chance landed a job on an organic vegetable farm – first week I loved it and knew I wanted to do it. Farming made sense to me. I’m really drawn to farming and healing earth and people. And I love vegetables! I love eating them all the time. What was the hardest part getting started? The hardest part was just doing it, just figuring it out. Figuring out how to grow in this high mountain desert; irrigating is hard in this climate. And building a customer base. I was new and didn’t have any customers, so it was hard all around. What surprised you about farming? Well what has surprised me is the big development of people wanting to get into farming now - this big sustainable farming movement. Not just wanting to do it, but how many people want to support the farms by paying the premium. That’s what surprises me; that more people are paying more money for local food. When does your day start and end? Right now it starts at 5:30 am, I have some coffee and goat milk. Then I go outside right away and feel the weather and the day, check on the greenhouses, especially the smaller propagation house. I make sure it’s not too cold, and that all plants are warm enough. Then I go around the farm and turn on irrigation lines. If it’s harvest day I figure out total numbers for pounds of salad mix and carrots, figure out the picking schedule, harvest it all before the sun gets hot, put it in the packing shed to keep cool, and once it’s all in, I spend the afternoon processing the harvest. That involves sorting, washing, bagging, and putting it all into coolers until it’s sold. I also float around the farm checking irrigation, moving to next crops to turn some lines off, and some lines on. After harvesting there might be prepping ground for planting, tilling soil with the tractor, and preparing for direct seeding or transplanting. Then I have computer work - writing to customers about what’s available and sending the newsletter. There is so much going on in one day, it’s a juggling and prioritizing act. What makes you happy in a day on the farm? What makes me happy is when I get a lot of things done and it goes smoothly. When I get to cross my list off. When I don’t get done what I want to get done. The main thing is when I don’t get my list crossed off. Specifically when the tractor won’t start. And when major irrigation lines break… that’s a big job to fix. Any lessons learned on the farm? The overall lesson I’ve learned in farming is no matter what, even in the middle of when you’re failing at farming - you didn’t plant enough, frost killed, seeds didn’t sprout, people didn’t show up - no matter what, it always works out somehow. And each season is amazing in its own way. Try your best always. What do you think a big misconception is about farming or farmers? That they’re dumb, they’re not worthy of getting paid, they don’t deserve to make much money, status quo. Any advice to other farmers? I’d say stay small, and grow extremely high quality produce on the smallest piece of land and get the premium. Get their full worth. You sell directly your customer; don’t wholesale until you have to. Anything to say to people who aren’t farmers? Support the farmers in your area, support locally, buy right from the farm, grow a relationship with a farmer in your area and support them. What concerns you the most about the future of farming? I guess I would say overall that somehow or another we can keep some kind of a freedom to farm, not so many limitations, so that it’s easy for young people to farm. I’m concerned about bigger corporations, controlling government, and laws that keep young people from being able to farm. GMOs having access to farmland. Big companies rule the world if they develop certain laws and will push small farms out of business and keep young people from farming. Where do you think you'll be in 5 or 10 years? I will be farming here and teaching what I’m learning around the world.